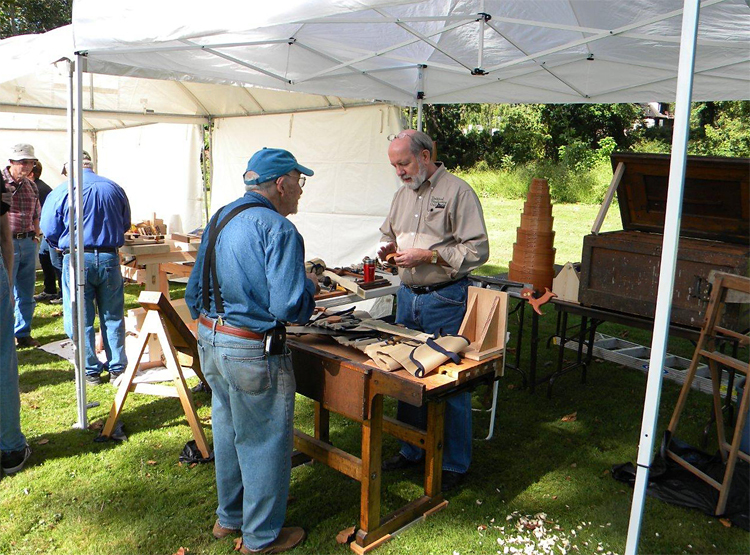 Two friends and I set up shop at Fort Hunter Day this past Sunday. We had a steady stream of interested folks stop by our tents throughout the day. I demonstrated chip carving and dovetailing and learned a few things from the experience. One woman who was a quilter mentioned that a particular knife cut I was making was called "pumpkin seed" in quilting. It's not surprising to hear that there's a crossover between crafts. 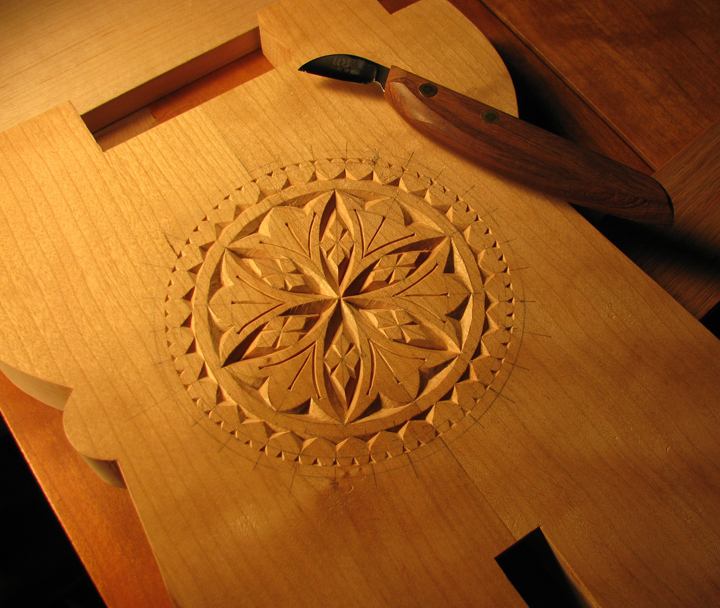 In fact, many of the same patterns found in chip carving are also found in fraktur paintings. Another woman with an eastern European accent asked where I had seen the design that I had carved on my gothic stool. I told her it was from a book, and she said that she recognized the pattern. "Is traditional Transylvanian rosette," she said. How cool is that?? One guy stopped by and asked me (tongue-in-cheek), "Where's your husband? He does nice work!" From that I learned to not set up my booth next to my friend (Dan) who had no doubt put him up to it. We borrowed the spill plane that I had made for the York Agricultural & Industrial Museum and shaved spills for the kids. After we explained what they were used for (the original matchstick), we told them that they were also Harry Potter wands. It was a big hit. I had two boxes sitting near one another in my booth. One was a walnut and spalted maple sliding lid box with fine, thin dovetails. 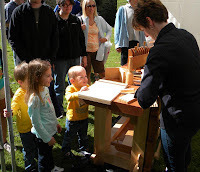 The other was a chip carved pine box with chunky, awkwardly large dovetails. Without exception, every visitor who noticed the boxes reached for the chip carved box. Not one person commented on the walnut box. 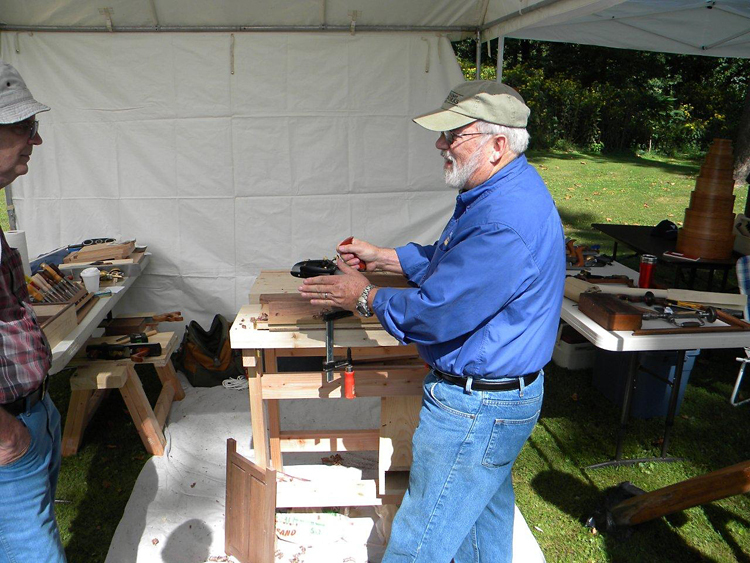 I think that most people look for furniture with dovetailed drawers because they've been told they're a sign of a well-made piece, but perhaps only another woodworker actually admires dovetails. It seems to me that most non-woodworkers will notice ornamentation or interesting figure or a nice finish, but not joinery. It makes sense. We might not know what makes a good quality quilt, but we would certainly notice the fabric and colors. We set up our booths at 7:15 that morning and broke down our tents by 6:30 p.m. We were completely exhausted. The woman in charge of our area asked if we would consider doing it again next year and I said we'd think about it. Yesterday, a friend sent me photos that he had taken that day. When I saw the last one, I forgot all about how tired I had been and decided right then I'd do it again. How could I say "no" to those faces? The three photos from Fort Hunter were taken by Robert Newmyer. Thanks, Bob!